Federal Reserve Chair Janet Yellen went out of her way during her March press conference to emphasize the central bank's decision to raise interest rates by a quarter percentage point was predicated on past economic performance, not extrapolations about future policy from the administration of President Donald Trump. 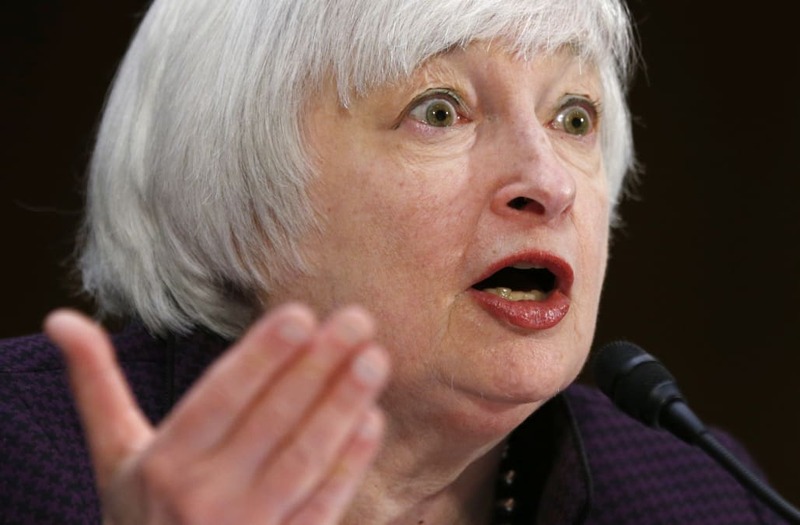 "The basis for today's decision is simply our assessment of the progress of the economy against our long-established goals of maximum employment and price stability," Yellen told reporters on March 15. "There's nothing that we have done or anticipate that is a speculation." In that light, policymakers are already expressing some trepidation that the failure of Trump's healthcare bill could compromise the rest of the president's agenda, potentially throwing some cold water on some of the stock market's recent optimism about the president's pledges to cut taxes and slash regulations. Stock prices jumped more than 10% in the months after the election, while yields on the 10-year Treasury note climbed as high as 2.64% before retreating to 2.40%. Bond yields move opposite to their price, and Treasurys are seen as a safe-haven investment for those who are averse to risk. A look at the Federal Reserve's own pension fund suggests those who manage central bank employees' retirement money are taking a similarly cautious view of the Trump trade, which has consisted in a sharp run-up in stock prices to new records and a brief but significant spike in bond yields that, for a moment, reflected expectations of potentially higher inflation. The idea was that a Trump presidency accompanied by a Republican Congress would ease Washington's gridlock, a prospect that looks far less certain the wake of the healthcare policy debacle. Thomas Costerg, economist at Standard Chartered, reviewed the central bank's recent financial statements release March 24 and found something interesting. "The Federal Reserve's pension fund asset allocation appears to reflect the Fed's caution about the reflation trade: it seems to underweight equities," said Costerg. The Fed's 2016 financial statements show overall stock holdings fell to 45.6% in 2016, from 47.7% in 2015 and 48.3% in 2014. The proportion of US equities fell to 24.6% of the portfolio from 25.4% in 2015; and for overseas stock holdings that figure declined to 16.3% from 17.8%.